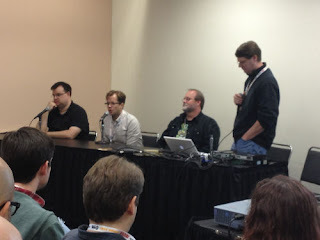 Comics Experience Blog: "Pitching for Professionals" - Notes from the NYCC 2012 Panel! "Pitching for Professionals" - Notes from the NYCC 2012 Panel! Hey, did you miss the Comics Experience panel on pitching, held at NYCC 2012? Well, if you did, you still don't have to miss out on all the tips. Louis Falcetti provided his notes from the session in a report filed on Bleeding Cool on October 20, 2012, so it's almost like you were there! When you finally have an editor willing to hear your ideas, will you be ready? From tips on how to succeed in a "bake-off" competition to how to present ideas cold, this panel will help you and your project get the green light it deserves! Listen in as former Marvel and IDW editor Andy Schmidt, Marvel Editor Nick Lowe, writer Paul Allor (TMNT Micro-Series, Clockwork), and Bob Schreck, Editor-in-Chief of Legendary Comics and former DC Comics, Dark Horse Comics, and IDW Publishing editor, discuss the ins-and-outs of pitching!